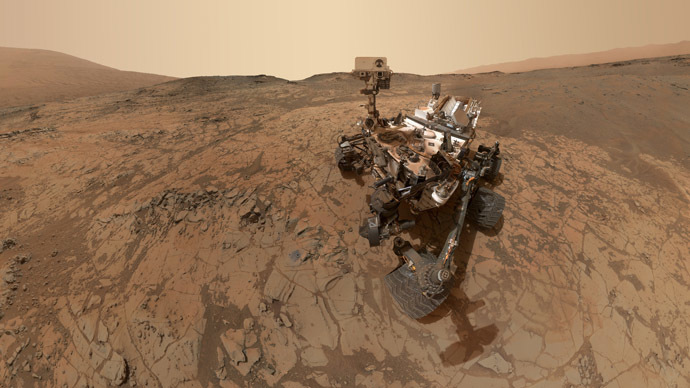 NASA’s Curiosity rover has taken the selfie-to-end-all-selfies – the photograph is actually a collected view of two-and-a-half years of adventures on Mars. The vehicle is currently at the base of the 3-mile-high Mount Sharp. The mosaic of images is assembled from dozens of different ones, and has Curiosity looking into the lens with the Mojave 2 drilling site just behind, as it gets ready to drill into bedrock at another site called Telegraph Peak. 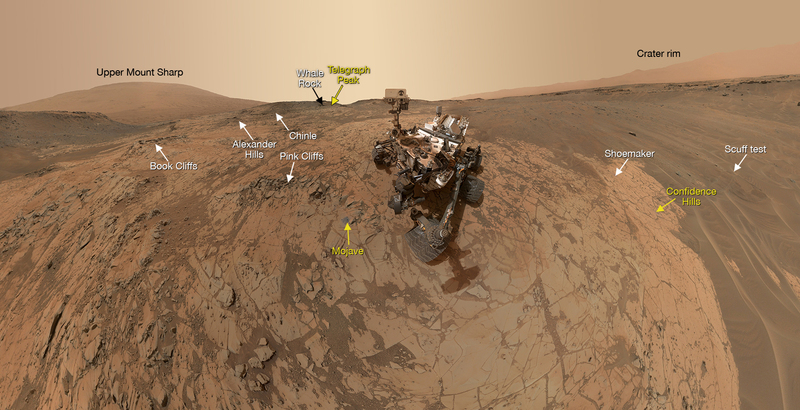 An annotated version of the self-made photo was posted to NASA’s website, showing where the rover is in relation to the aforementioned spots, as well as Gale Crater and the top of Mt. Sharp. "Compared with the earlier Curiosity selfies, we added extra frames for this one so we could see the rover in the context of the full Pahrump Hills campaign," Kathryn Stack at NASA’s Jet Propulsion Laboratory says in the press release. "From the Mojave site, we could include every stop we've made during the campaign." An earlier selfie also comprised dozens of images, but was less detailed. However, it did have a beautiful view of the impossibly tall Mt. Sharp menacingly rising up in the background. All the while Curiosity has been digging for rock and analyzing samples. The newest batch from Mojave, Telegraph Peak and other sites should give clues to the current locale’s ancient history – key to tracing the planet’s formation and the existence of habitable environments on it millions of years ago. Last month’s pictures were taken at ‘arm’s length’, with Curiosity’s robotic MAHLI camera, which extends out of the rover, and therefore is not seen in the pictures.